We don't often think of DIY (Do It Yourself) projects as being valid blog post titles for blogging sites, but let me tell you, whether or not you are good with a paint brush or a power drill or a sewing machine, the DIY Newsletter Evaluation is one DIY project you do not want to skip! 1. Every single social media platform starts out free, only to get you hooked and then insist on charging for services that have been previously free. Brilliant strategy, by the way, just not appreciated in the “pay now or get 0 reach from here on out” moment. 2. Social media could shut you down or cease to exist at any moment. Case in point: This week, my friend Kara Carrero's site was wrongfully reported as spam on Facebook and Pinterest and immediately her links and posts were locked down and her traffic suffered dramatically while she argued with the “powers that be” to try to get the ban lifted. Totally unfair – click here to go visit her site, it's awesome! Your list is the only method of communication with your readers and followers that you own. If you are not building your list, START NOW! If you're offended or feel I am yelling by putting that in all caps, I sincerely apologize, but it is that important. Please, start today. You can use my referral link to sign up for MailChimp for free up to 2,000 subscribers. It's what I use and really easy to learn. If you are building it already, take a moment to pat yourself on the back. You are on the right track! The question now becomes, are you getting all the subscribers that you could be getting? I have created a DIY Newsletter Evaluation for you. This one is just the first part, where you will be evaluating how easy and enticing it is for people to sign up for your list. Because remember, blogging is not about me. It is about serving my readers, answering their questions, solving their problems, and encouraging them to greatness on their journey. The idea of this DIY project is to evaluate your own newsletter process through the eyes of a first time visitor to your website. You may also want to ask a friend or willing acquaintance to evaluate it for you, or trade evaluations with a blogger friend, giving kind but honest feedback and suggestions for improvement. The desired outcome is to improve, customize and streamline the process as much as possible to make it more appealing to more subscribers and the best possible positive experience it can be. Having a super experience when signing up for the newsletter is one of the keys to turning subscribers and freebie hunters into loyal followers and fans. We'll be talking about how to keep them on your list in a future post. 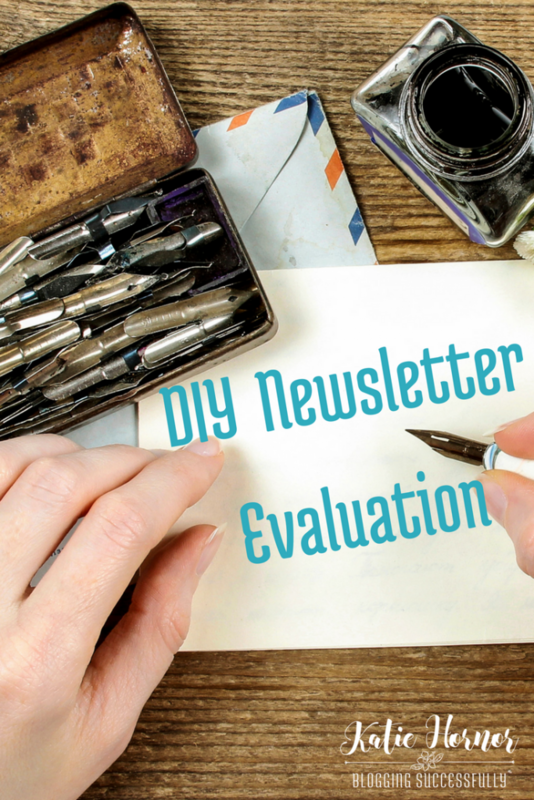 The DIY Newsletter Evaluation is a 5 page, downloadable, editable PDF kit. Once you complete your purchase with Paypal, and login to your account, it will be available for immediate download in your members area.